Here are some charts which I have been paying close attention to of late, and why. 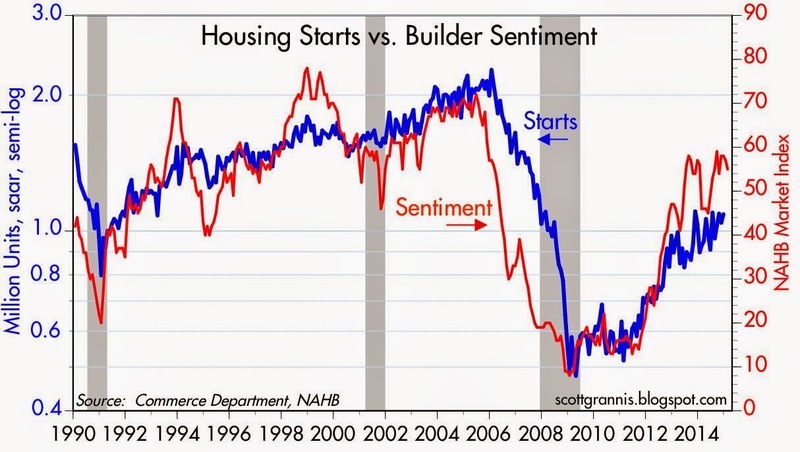 February housing starts are due out tomorrow, but today we got the latest builders' sentiment index—which dropped a little. But as I see it, both series appear to be improving gradually, with the sentiment index leading the way, not surprisingly. What it says is that residential construction is still relatively weak, but it continues to improve, and there is still plenty of room on the upside for further improvement. 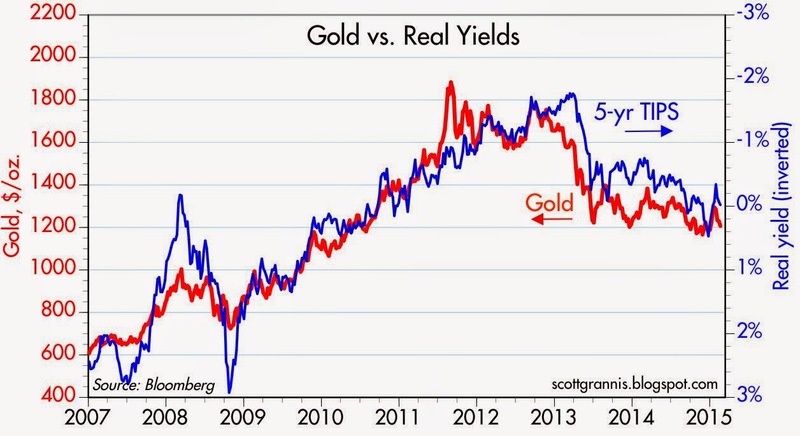 The price of gold and the real yields on 5-yr TIPS have tracked each other in a rather impressive fashion for most of the past 8 years. What possible connection could these two totally different and independent variables have? I think they are both good measures of the world's demand for "safe" assets. Or, to put it differently, they reflect the market's level of risk aversion. Prices for both had reached rather extraordinary levels a few years ago (signifying lots of fear and risk aversion), and now both are declining. (I'm using the inverse of real yields on TIPS as a proxy for their price.) They are both still rather high, but importantly, they are trending lower as risk aversion declines and confidence slowly rises. 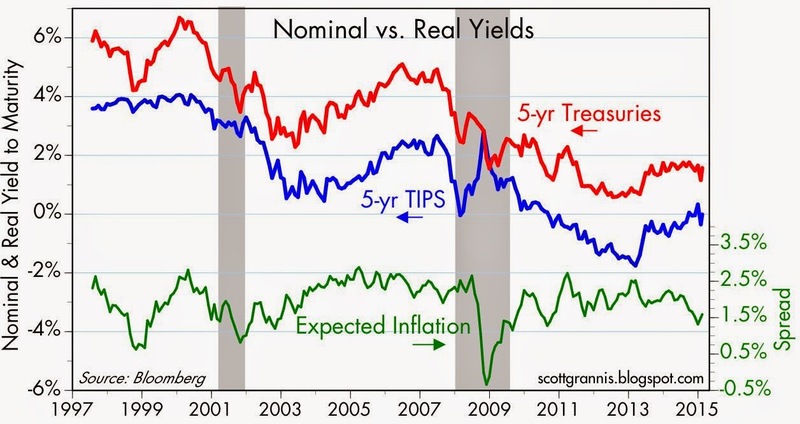 The difference between real yields on 5-yr TIPS and nominal yields on 5-yr Treasuries is a measure of the market's expected average annual inflation rate over the next 5 years. The chart above suggests that while the market expects inflation to be about 1.5% a year on average over the next five, there is not even a hint that the market is worried about too little or too much inflation. I've long argued that risk aversion has been one of the defining characteristics of the current business cycle recovery, and that continues to be the case. The market has suffered through repeated bouts of nervousness—as measured by the ratio of the Vix index to the 10-yr Treasury yield—but when fears of economic collapse fail to materialize, equity prices move higher. 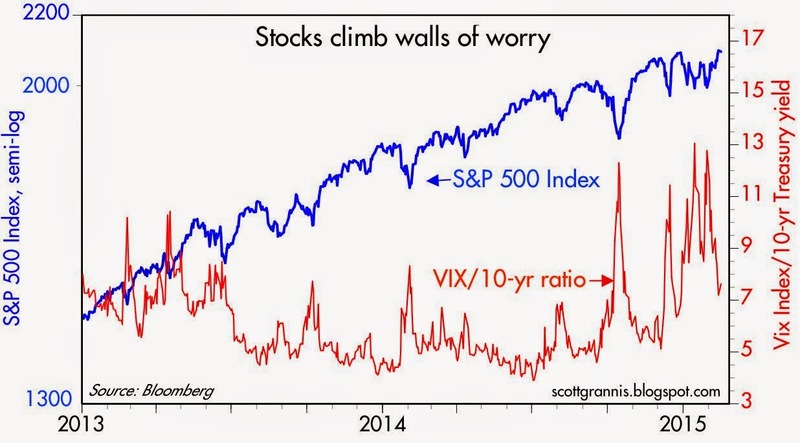 This is healthy, since enduring bull markets are usually challenged by ongoing worries that the good times won't last. If everyone were optimistic and unconcerned about downside risks, that would be the time for a prudent investor to be worried. There's a raging debate out there over whether stocks are over-valued, under-valued, or just right. 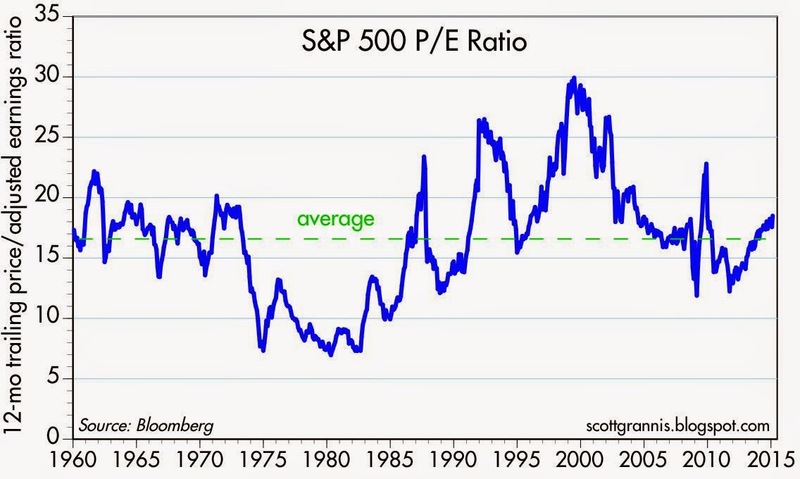 Bloomberg's calculation of PE ratios, shown above, suggests that equity valuations are slightly above their 55 year average. I don't find that disturbing, especially considering the extremely low level of Treasury yields. I believe that 5-yr real yields on TIPS are a good proxy for the market's view of the economy's near-term growth potential. The rather low level of real yields in the past 6 years suggests that the market has been very pessimistic about the outlook for growth. 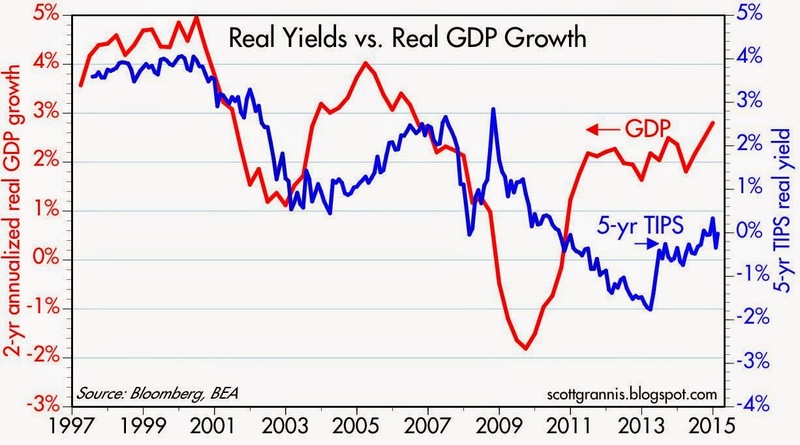 That has changed somewhat in the past two years, as real yields have moved higher and the market has come to accept that the economy is likely to continue growing but at a rather tepid pace. Last year marked an uptick in the economy's real growth rate, but the market is still reluctant to accept that the good times will endure. Troubles in China, the mideast, and the Eurozone are all good reasons for the market to remain skeptical. Not to mention the problems that still plague the U.S. economy: e.g., high tax and regulatory burdens. All of these charts are consistent with a market that is slowly regaining confidence, and that's good. scott, surely you are not eluding to the fact that you think you can TIME the stock market in any way? The best I can hope for is to identify periods in which the odds seem to favor (or not) investing in various asset classes. I'm a long-term investor by nature, not a market timer or a trader. Do you mean global boom in asset prices or global boom in economic growth? In Aus RBA easing is fuelling an already overly exuberant property market and some share market gains while unemployment continues to rise. Ausgarry--After 35 years of fighting inflation, and winning that war, the world's central banks will have to change their stripes.